← A Walk Down Memory Lane – The Very FIRST dearlanadee Podcast Oct. 28 2007 Rev. I never liked the attic. It was unfinished, small, dark and dirty. There were two open areas and one room with a door at the end of the hall. 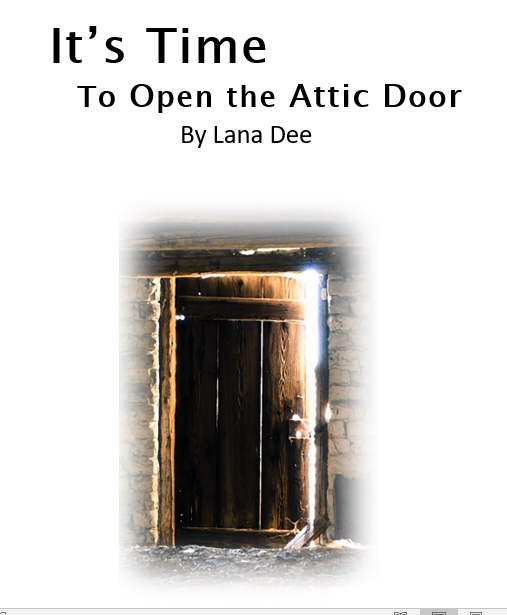 The slanted wooden walls were uninsulated, and the attic was cold. The only heat came from the floor below and what could drift up the stairs when the door was left open. It was as barren a place as any attic could be. I would venture up the steep narrow steps occasionally to see my brothers who slept there. A small door in the back wall led to the space my father used for storage. I could see the contents, I woke up. I had this same dream over and over for years. The location was different, but the theme was the same. The building and everything in it belonged to me but I would awake before I could see the contents. It drove me crazy! I tried for years to understand the meaning of this dream. finally understood what the Lord was trying to show me. This entry was posted in My Story. Bookmark the permalink.